The French Counter-Revolution was composed of various groups both in and outside of France who were opposed to the French Revolution and actively sought to change its course. It fit the Constitution because they weren't doing anything against the law. The storming of the Bastille prison on July 14th 1789 was an event that paved the way to further civil disorder and overhaul in France. This newly created assembly immediately attached itself to the capitalists — the sources of the credit needed to fund the national debt — and to the common people. They consolidated the public debt and declared all existing taxes to have been illegally imposed, but voted in these same taxes provisionally, only as long as the Assembly continued to sit. A fundamental document of the French Revolution and in the history of human rights, defining the individual and collective rights of all the estates of the realm as universal. Influenced by the doctrine of "natural right", the rights of man are held to be universal. During the French Revolution, the National Convention , in France, comprised the constitutional and legislative assembly. It held executive power in France during the first years of the French First Republic. 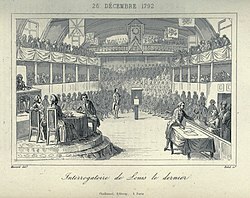 The Convention held its first session in a hall of the Tuileries, then it sat in the Salle du Manège, and finally from 10 May 1793 in that of the Spectacles (or Machine), an immense hall in which the deputies were but loosely scattered. This last hall had tribunes for the public, who often influenced the debate by interruptions or by applause. It was a major event of the French Revolution. After events on the 10 August 1792, which saw the fall of the monarchy after the attack on the Tuileries by insurgents, Louis was arrested, interned in the Temple prison with his family, tried for high treason before the National Convention, found guilty by almost all (and 'not guilty' by none), and condemned to death by a slight majority. His execution made him the first victim of the Reign of Terror. His wife Marie Antoinette was guillotined on 16 October, the same year. Napoleon Bonaparte's actions as a military and political leader in France, can be credited as having shaped the politics of Europe during the 19th century. He trained as an artillery officer, he was prolific at strategy and led two winning campaigns against opposing coalitions. A Conference of Ambassadors of Europeon States. The objective of the Congress was to settle the many issues arising from the French Revolutionary Wars, the Napoleonic Wars, and the dissolution of the Holy Roman Empire.